The best location for a home gym would be a basement or lowest level of the home with a concrete floor. The garage is another good option for a home gym. For light use, having a gym or workout space on the upper level may work for a stationary bicycle and light weights, but wouldn’t be a good option for a treadmill. Speaking from experience, the pounding on the treadmill is heard throughout the home and the sound of the ceiling shaking and lights flickering is an unnerving feeling I’d rather do without. We aren’t new to building home gyms, we have done them before in our prior homes (HERE). With each gym we build we learn what we like, what works and what we want to change. We also work out differently as we age, our body and endurance changes and we need to adapt with new techniques. Our prior home gym was built for High Intensity Interval Training (HIIT). While cardiovascular fitness should be a component of every gym, we built this gym primarily for strength training. For the record, when I say we have built gyms, I mean my husband. The gym is the one room in our home he gets to design solely on his own…and he did an amazing job with this one! He spent weeks, days, and hours researching gym equipment and finally decided to go with Rogue Fitness (HERE) for all our home gym needs. Rogue is the number one manufacturer of American made barbells and distributor of strength and conditioning equipment, including weightlifting bars, plates, racks and other fitness related equipment for personal home and professional sports teams. They are also the official supplier for the CrossFit games. Let me take you on a tour of our gym. Frameless double doors lead into the gym. The ability of the doors to swing both ways is a bonus of frameless doors. Glass doors also give the gym a sleek and modern look and make the gym visibly appealing when not in use. The gym consists of floor to ceiling mirrored walls and rubber floor tiles (HERE). We have added rubber tiles to all our gyms and find them to be the perfect flooring for the space. My husband installs them himself and is always happy with the results. They would work great for a garage gym as well, or an area where you only want a small space covered instead of the entire area. My husband spent hours researching racks and finally decided on this monster rack (HERE). This flat foot rack provides a ton of functionality with a stabilizing base which means it doesn’t have to be secured to the ground. This rack is the largest rack you can get that does not require being bolted to the floor. When ordering the rack, we found cost savings by bundling certain accessories in with the rack. The accessories we added to the rack include the Ohio bar shown here (weights not included). This particular bar is finished in black zinc with bright zinc. We also added the 43″ fat/skinny pull-up bars, which attach to the top of the rack and are used for pull-ups. In addition, we added the adjustable bench 2.0 which features 6 incline positions ranging from flat/zero degrees up to approximately 85 degrees. The seat has two adjustment settings, and (unlike just about every other adjustable weight bench on the market) there is virtually no gap between the seat pad and the back pad, which means you can perform functional presses and arm movements through a full range of inclines. The rack also comes standard with pin-pipe safety bars on each side. So bundling the Ohio bar, adjustable bench and pull-up bars provided some cost savings. We did not bundle plates in the order, but chose to order those separately. That’s an overview of the rack with bundled accessories. The rack has the ability to add many other accessories onto it – take a look at what we chose. This plate storage bar (HERE) attaches nicely to the side of the rack to store weight plates, and is about 13″ long. This matador (HERE) easily attaches to the rack and is used for dips. It measures 24″ in length by 27″ in width and like all other Rogue products made from heavy gauge steel. The matador is heavy duty yet attaches to the rack with a single push pin- no tools required. It is sturdy enough to support weighted dips, and the rack will not rock or sway. The bar weights we use are color training plates (HERE) and a plate cart (HERE) to hold the weights. This 320 lb set comes with 2 of each; 55 lb, 45 lb, 35 lb, and 25 lb plates. The additional plates include 2 of each – 10lb, 5lb, 2.5lb and 1.25lb weights. With the whole family using the gym, including the kids and myself, we use the junior bar (HERE). This 22 lb bar is perfect for women and beginners alike. The other bar shown is the Ohio bar (HERE) which I discussed above. Another great rack accessory for youngsters/woman is the Kids Pull-up bar (HERE). It has an easy push-pin attachment method and adjusts from ground level to 7 feet. I use it myself and really like the adjustment factor, I feel safe and don’t need to stand on a chair like I did with prior pull up bars. 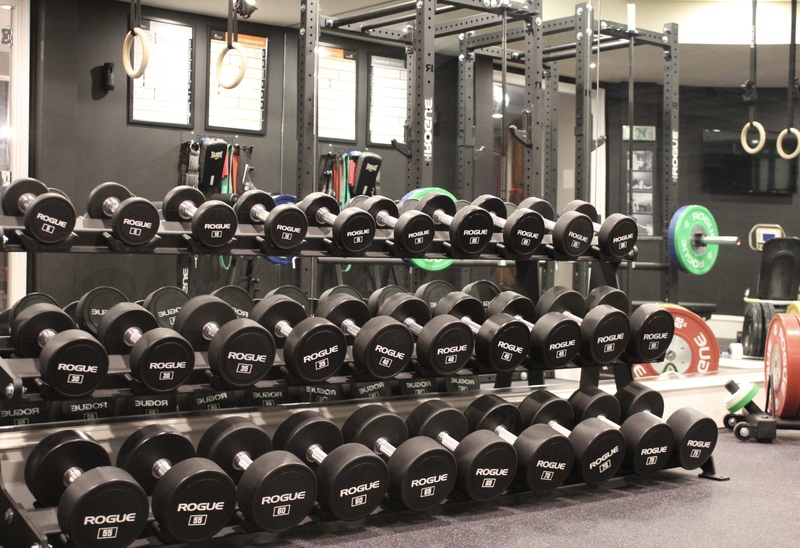 Every great gym needs a dumbbell rack, and this mother of all racks stores 30 dumbbells or 15 pairs (HERE). This rack features rubber-encased saddles and a central rail divider to prevent the dumbbells from sliding or catching your hand on a misplacement. The rack is a built to order item and requires a lead time of 3 – 6 weeks. The dumbbells are sold in pairs and available in 5 lb increments, up to 75 lbs (HERE). These dumbbells feature solid steel heads with urethane plating. The heads are welded to a 6” straight chrome handle to create a solid, single-piece dumbbell. It moves easily and won’t damage your flooring on a drop. Each head is finished in a black matte with bright, clear markings and the Rogue logo in print. The combination of the urethane plating and textured finish makes these dumbbells low-maintenance and looking like new even after long periods of use. This rack really is “the bomb” and makes the gym a true professional athlete’s gym. Another unique feature of the gym are these wood rings (HERE) and hanger (HERE). They provide a texture, grip, and light feel quite different than steel or plastic rings. These rings can be used for a wide variety of training exercises and are the same rings used in the last three CrossFit Games. The last major piece of equipment I’d like to show is the Abram GHD (Glute Ham Developer) 2.0. The GHD (HERE) is a comprehensive tool used for strengthening. It has a triangular-base design and rubber feet for maximum sturdiness. The GHD is an amazing piece of equipment for strengthening the abdomen, lower back, hip flexors, gluten, and hamstrings. Moving onto storage, we like to have our accessories neatly stored and available for easy access. We store them on this belt and band hanger (HERE). It is wall mounted and has 10 prongs providing plenty of storage for lightweight accessories. We use it to store our dip belt (HERE), weightlifting belt (HERE), elastic bands (HERE) and kick pads. The weightlifting belt is thin but still provides firm, stable support of the abdomen and lower back, while performing squats, deadlifts, hang cleans, etc. The dip belt, as seen in competition at the CrossFit Games, is used mainly to add resistance to the body. The belt allow for a high load capacity and comes equipped with a reinforced, comfort-fit nylon body with heavy stitching, a 30″ total chain length, and a pair of straight-gate, locking carabiners. We chose the belt in black. The bands are a versatile, go-anywhere accessory for customized resistance training—from mobility work and pull-up assistance to banded squats and bench presses. The last thing I want to mention about the gym is the wall color. We painted the walls a matte black, color is Sherwin Williams Tricorn Black. To summarize, the products we used are listed below. Thanks for stopping by, hoping I inspired you to build your own gym! Subscribe to the blog for more great ideas, tips and tricks and you can also follow along on Instagram (HERE) for more inspiring posts. See you next time! Wow !!! I would love to join that Gym!! !